Christopher Schmidt’s DJI Phhantom FC40 Quadcopter was flying over Magazine Beach last week and captured these views… Thank you, Christopher! Over the past several months, I’ve been a regular visitor to Magazine Beach, at all times of day. As an owner of a new RC aircraft — specifically, a Phantom FC40 quadcopter — I’ve loved the open space of Magazine Beach for walking, and flying, in a beautifully scenic spot. I’ve been able to fly at all times of day, from morning to night, and had conversations with dozens of people about the power of the quadcopter for aerial photography. Whether it’s filming rowers from Riverside Boat House along the river, catching an aerial shot of a little league game at Brud Whalen field, or just navigating the trees and picnic tables near the Powder Magazine, the park offers great oppourtunities for fun in the sun. 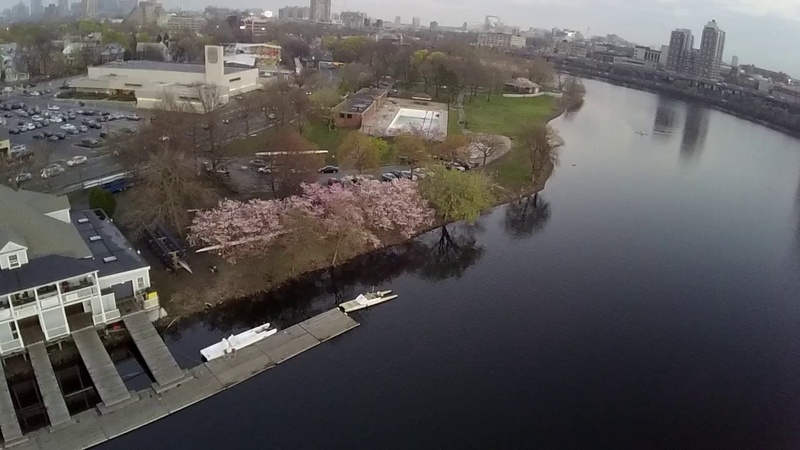 The great space, and great conversations with other people about this new technology and the benefits it gives for aerial photography, keep me coming back to Magazine Beach to enjoy a beautiful spot along the Charles River. Not sure if I’ll be doing anything for Fourth of July. The crowds of people make playing with the drone a pretty serious risk, not to mention increased police presence and overall wariness of people. I love flying the drone, but as a hobbyist, I don’t have any desire to get in trouble or to risk hurting people, and will probably choose to be safe and keep it at home that day.